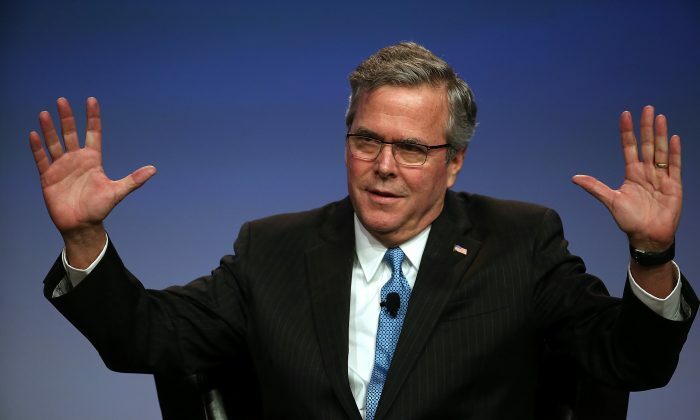 GOP 2016 front-runner Jeb Bush scarcely had any time to celebrate the exit of his rival Mitt Romney before he was hit with the first character-assassination attempt of his campaign, and likely not the last. Just hours after Romney told supporters that he would not run for a third time in the 2016 elections, the Boston Globe published a long profile of Bush that painted him as an aimless pothead and a bully during his high school years. The profile found a few of Bush’ former classmates from Phillips Academy in Andover who characterized him as someone who “smoked a notable amount of pot” and, at six-foot-four, “sometimes bullied smaller students” during his time there. “He sort of lifted me up in the air and I think was going to squash a grapefruit in my face,” recalls David Cuthell, who remembers being rescued by an even burlier friend before Bush did anything more. Bush also admitted that his freshman grades were so poor that he was almost expelled, but denied the bullying accusations. The profile also painted Bush as being uninterested in politics in his high school years, having refused to join Progressive Andover Republicans club, and neither supported nor opposed a petition expressing a lack of confidence in the school administration during his senior year, at the height of the Vietnam protests. Bush isn’t the first Republican to have his high school years scrutinized by the press. In May of 2012, the Washington Post found high school classmates of then GOP front-runner Mitt Romney who recounted an incident where Romney allegedly pinned down a fellow classmate and cut off parts of his hair, which was labeled effeminate because it covered one of his eyes. Before Romney’s exit from the race, Jeb Bush led in the polls among likely Republican primary voters, among whom half said they wanted to see Bush run. Read the profile of Bush here. In announcing that he would not run for the Republican party presidential nominee after all, Mitt Romney emphasized that his message resonates with likely voters.